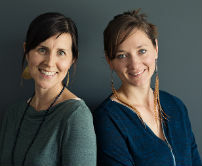 Kyla Gent and Milena Huebener are co-founders of Glow Décor Rentals, an event rental company serving the Columbia Valley. As wedding and portrait photographers, they always had a strong eye for style and a passion for enhancing memorable experiences. After years in the wedding industry, they saw an opportunity to introduce beautiful and unique furniture and lounge areas to enhance events both photographically and experientially. Based in Invermere , BC, Glow Décor Rentals offers a combination of vintage, rustic and modern furniture along with unique table top decor for weddings and events. Q. What services has Women’s Enterprise Centre ( WEC) provided you and how have these services helped you? A. WEC inspired us to write a thorough business plan, research our market and develop a deep understanding of cash flow projections. WEC believed in our vision and granted us the financing necessary to build our inventory. A. We had already been running our own businesses as sole proprietors and we felt that starting a corporation was the next step in developing our business skills. A. The biggest lesson that we’ve learned so far is that rewards come not just in financial gain but in experiences, skills, connections and the growth of our network. A. To elevate events through beautiful and memorable décor that create spaces for people to gather and celebrate. We would also like to create an inspiring company culture for all of our future employees. We would like to be a market leader and trendsetter for unique wedding experiences that bring dreams to life. A. We have great attention to detail and we’re not afraid to put in the work to make our business thrive. A. As entrepreneurs we have learned that working as a team is incredibly powerful. Having a partner that we trust and respect allows us to provide a better product and service that benefits from our individual strengths.